Would you like to have some time just to be with God? A quiet time in a busy stressful life? A time to focus on God? We are surrounded by noise. Julian Meetings allow you to set aside time to sit in silence and 'to remain still and let God speak and act in you', so said Meister Eckhart who lived in the thirteenth century! 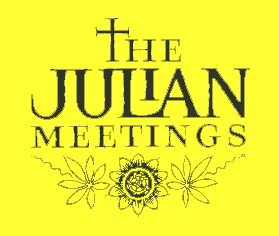 Julian Meetings are named after Julian of Norwich, the fourteenth century contemplative woman whose view of a generous and homely God struck a responsive chord in the minds and hearts of the founders of the movement. Numbers vary from two or three to up to twelve people of various denominations. A meeting starts with music or a short reading followed by about thirty minutes of silence and finishes with a short prayer or the Grace. If people want to share a time of fellowship or talk about their time that is fine, perhaps over a cuppa or if you want to leave in silence, that's fine too. Today there are over three hundred Julian Meetings in the UK and a growing number worldwide. The Jersey Julian Meetings are affiliated to the national Julian movement and meet on the first Tuesday of each month, 2.00 pm in the Lady Chapel inside St Martin's Parish Church. We look forward to hearing from you, or seeing you soon.